SIAS is a skillful and dedicated partner for anyone seeking success in the real estate or financial business. We offer services to support overall real estate business operations, including real estate development projects, project promotion support, real estate liquidation, consulting and promotion services for real estate businesses, and partnerships with other companies and various industries. Our services include proposals on real estate liquidation/securitization and project/asset financing, as well as support for structuring and execution. We are available for consultation on issues related to real estate management and administration, including providing asset management services for real estate projects, planning tenant mixes, and controlling overall leasing operations. Our project management services are designed not only to control "cost," "scheduling"and "quality" in manufacturing but also to develop and construct new projects from the ground up and implement them accordingly. As project leaders, we intend to carry out the entire process that leads to successful projects. Furthermore, we aim to bring success and satisfaction to a wide range of stakeholders who are involved in such projects. Business concepts, designing, planning, obtaining development permits, cost control, schedule management, architectural management, etc. 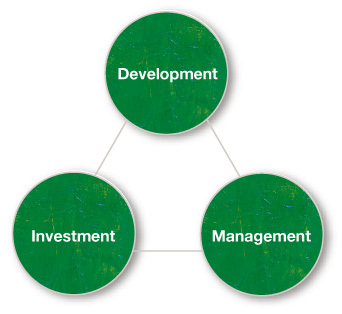 Business plan development, finance arrangement, documentation, legal and tax issues, risk-return analysis, etc. Tenant leasing, planning of total and day-to-day operations, reduction of operating costs, asset management, property and building management, etc.